I promised you all some news. So here it is... A few days late but exciting all the same. On Thursday November 5th, I’ll be at Webs in Northampton, MA to launch my new book Color By Kristin from 6 to 7:30. 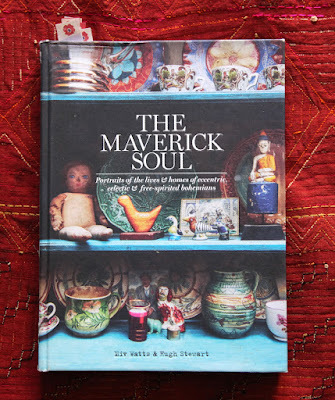 This is the Book Launch - where I send it out into the ether and hope it flies! All of the projects from Color By Kristin will be there as will projects from my last book Kristin Knits. Last Wednesday I taped a podcast interview with Owners Kathy and Steve Elkins from Webs. 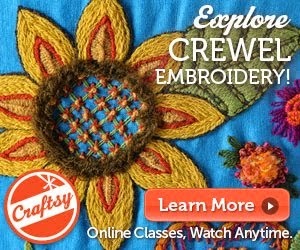 You can find the interview here on the Webs Yarn Blog. Kathy is delightful and enthusiastic and I thank her for inviting me to be on the show. In addition, for all you internet readers and shoppers, I'm excited to announce that Webs is now carrying my Julia Yarn in their store and on their website. You can find Julia on their website here. In addition to the Webs source for Julia Yarn, check your local yarn store. Here in the Pioneer Valley, Webs is just one of my local yarn stores and so it is very exciting for me that they have decided to carry Julia. Near you, your local yarn store may also carry Julia and I would hope that you would support them. Local yarn stores are quite like local bookstores, local clothing stores, and more. Local businesses have to fight to survive. Chain stores seem to rule America, as much as I dislike many of (but not all) them. It takes grit, determination, creativity, a possible bit of insanity and much more for a local yarn store to survive. Support them or they will disappear and you will be sad. Sometimes I hear from knitters who would like to buy my Julia Yarn. Their local yarn store does not carry it and they want to knit the project just as I designed it in the colors I envisioned. They want to order the yarn from me. I’m not interested in selling yarn direct to knitters. I have no infrastructure for such a project, nor do I have the space to house bags and bags of yarn. My family would go mad and the cats would sleep amongst the balls of yarn. How would that be? Sounds like a nightmare for me. There’s not a lot I can do from here on the farm to get yarn into your local yarn store. My Julia Yarn gets into your local shop via a sales presentation by a local sales representative who works for the fine folks at Westminster Fibers. 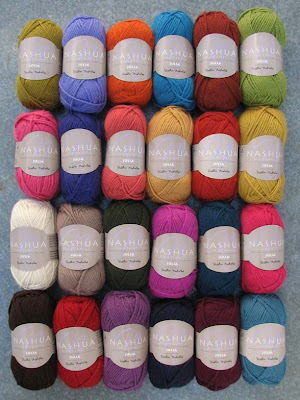 My Julia Yarn is sold under the “Nashua” brand and those Westminster sales reps also sell Rowan, Gedifra, Regia, and more. When they call on a shop, they have less than a few hours to present all the lines they carry. Some of those reps choose not to show the Julia Yarn to the shopkeeper. And there goes your chance to buy Julia at your local store. Sometimes your local shop owner can’t afford to bring in another yarn and so they say no, maybe next year. Me, sitting here on our farm, as you can probably understand, I have nothing to do with all of this. I send my Julia Yarn in beautiful colors out into the world, hoping the sales reps will show it and the yarn stores will buy it. If it doesn’t happen, I won’t know nor will I be able to do anything about it for you. For a fact, I know that there is not an inch of my Julia Yarn in the NY/NJ Metro area. What can I do….. Not a lot. Complain, oh yes. How far does it get me? Not far. So now, if you are living in those “Julia-starved” areas of the USA or Overseas, you can now purchase Julia from the fine folks at Webs. The very cool thing is that Webs has also built a Kit Option for all the projects in Color by Kristin. Each and every project from my new book along with photos, yarn amounts, needle sizes and more is listed on the Kits Page on their website. The website amazingly extrapolates by size each project, adds needles, the book and all. You can customize the order (don’t need needles, no prob). I can’t imagine how much programming this could have taken so the whole presentation totally blows me away. Check it out here and listen to the podcast if you like. I’ll be at Webs in Northampton on Thursday from 6 to 7:30. Stop by if you are local or if you are up for an early November adventure! 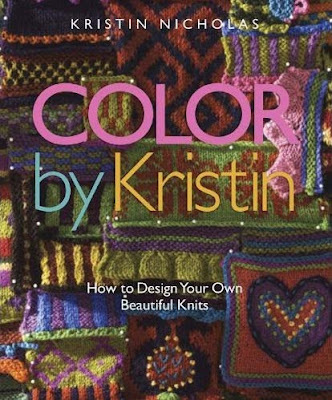 I’ll be happy to help you pick yarn for a Julia project and sign a copy of both Color by Kristin and Kristin Knits. And... if you have been waiting to hear from me, I’m sorry. My modem broke two Thursdays ago before I headed off to Stitches. It is finally fixed and I am now back on-line digging through all the e-mails I haven't answered. Thanks to all for your patience. Julia Yarn at Webs Link Color By Kristin Kits at Webs Link See you all at Webs on Thursday Evening from 6 to 7:30! I am so excited that Webs will have Julia! I have asked both of my local LYS's (there are a number of other sort-of-local LYS's as well, but I'm not going to spend all day driving around), and they have no plans to add it. . . believe me, I do my part to support them! So I will feel no qualms about ordering via mail, and I can't wait to use that gorgeous stuff. Wonderful! Those Bloomsbury Gauntlets are definitely on my list. Wishing the best for the book launch. This would be awesome to win. I made it to Webs this year and I will have to go again soon. I was overwhelmed! I am living in Belgium but Webs is my online shop...super for your yarn!